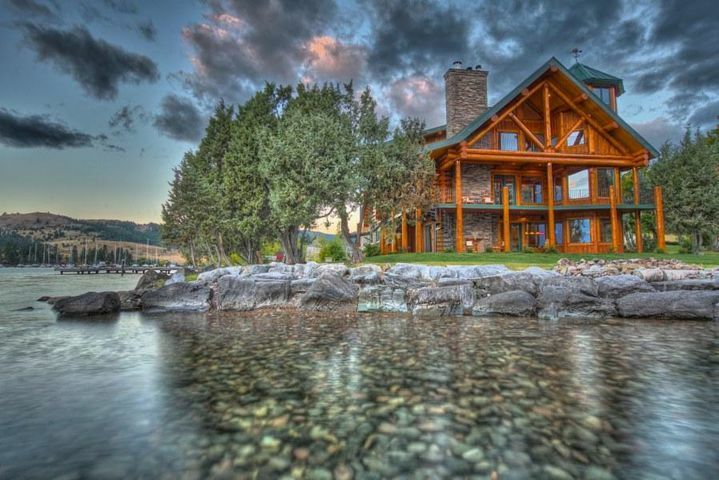 Over 200 feet of level Flathead Lake waterfront and a masterpiece log home. Explore stunning spaces both inside and out of this true Montana dream property. Spacious great room with gourmet kitchen on main level with master suite and indoor hot tub. Generous windows with spectacular views across the lake to Wild Horse Island and Swan Mountains beyond. Additional living space and bedrooms both upstairs and down. Separate guest quarters attached to garage/shop just steps away. Log home living at its best. Remarks: Over 200 feet of level Flathead Lake waterfront and a masterpiece log home. Explore stunning spaces both inside and out of this true Montana dream property. Spacious great room with gourmet kitchen on main level with master suite and indoor hot tub. Generous windows with spectacular views across the lake to Wild Horse Island and Swan Mountains beyond. Additional living space and bedrooms both upstairs and down. Separate guest quarters attached to garage/shop just steps away. Log home living at its best.